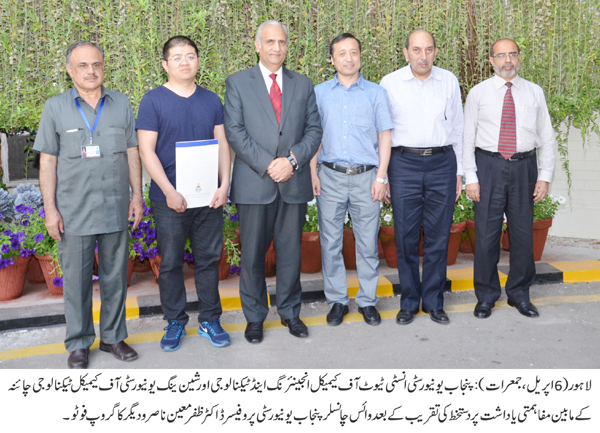 LAHORE: (Thursday, April 6, 2017): Punjab University Institute of Chemical Engineering and Technology has signed a memorandum of understanding with Shenyang University of Chemical Technology, China. 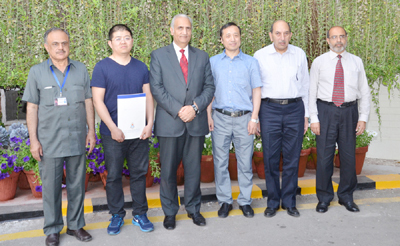 In this regard, a ceremony was held at Vice Chancellor's office in which PU VC Prof Dr Zafar Mueen Nasir, Director PU ICET Prof Dr Amir Ejaz, Dean at Shenyang University Prof Weiru Chen and Registrar Dr Muhammad Khalid Khan were present on the occasion. Later, Shenyang University delegation visited ICET and visited laboratories, met students and teachers of the institute. Shenyang University of Chemical Technology has agreed to provide 20 internships to 6th semester students of ICET. In this regard, they will provide opportunity to ICET students with all the expenses of boarding and lodging covered for six weeks internship every year.